Love local wine? Subscribe to Traverse, Northern Michigan’s Magazine for more. First, let’s get a primer on the last two vintages. How did 2016 and 2017 shape up for wine production? 2016 was one of those rare vintages that favored both reds and whites on account of a warm, beautiful fall. Overall quality was good in 2017 but not as consistent as 2016 because of the weather erratically swinging between warm and cold. 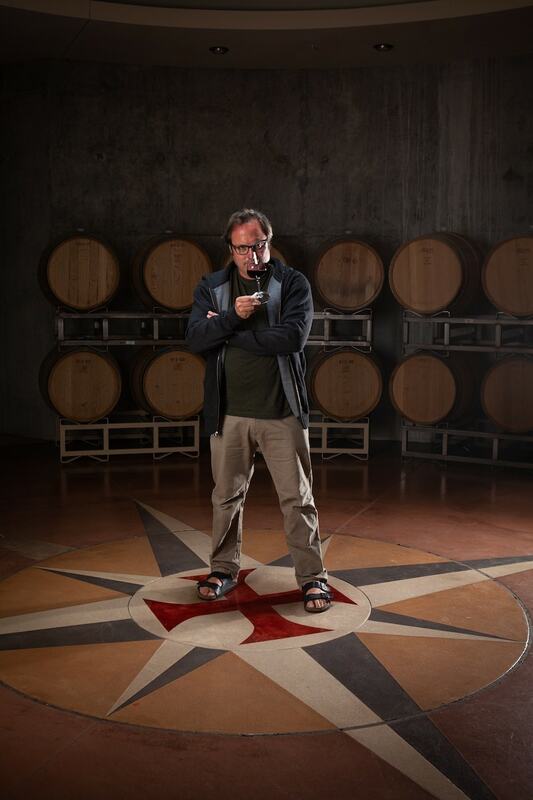 Now that Mari’s new winery is fully established, what’s its imprint on the Old Mission Peninsula wine scene? Because we’re faced with unique challenges here in terms of climate I think we need to learn from other edgy regions and try new techniques. Here at Mari, I think our edge is the Nella Serra system, our hoop house tunnels. Blending 10–15% of those grapes with our conventionally grown fruit gives the wines weight and texture and means we never have to add sugar. I’ve also learned to blend red varietals for balance. Let’s stay with blending. How have the Italian varietals you planted three years ago become part of the program at Mari? The Italian varietals seem to have grittier tannins and a whole different set of aromas. Teroldego and refosco, both grapes from Northeast Italy, are doing really well. They both have high acid, high tannin and give great color. The best teroldego barrels are getting blended with our merlot in a new wine called Proserpina. The earthy flavors of autumn cooking mean our wines should take a turn toward the dark side. Uncork these clutch bottlings from the exemplary 2016 harvest. A blend of conventionally grown cabernet franc accented with 25% cabernet sauvignon from Mari’s Nella Sera hoophouse system, Praefectus is forward with briary black raspberry, tar and cocoa accented with toasty oak. Pair with rosemary-rubbed lamb chops. An unexposed ace-in-the-hole among Northern Michigan red varietals, CGT’s gamay yields a bright profile packed with tart cherry and tellicherry peppercorn made for fall mushroom risotto and pan-roasted lake trout. Winemaker Cornel Olivier teases remarkably expressive pinot noir from the soils surrounding 2Lads. Cuvee Beatrice sings with high tone red berry fruit and vanilla imparted from 10 months in French Oak. Plays nice with an autumn hash of butternut squash, mushrooms and smoked duck breast. We should all be drinking Northern Michigan merlot. Expansive, luscious and replete with black cherry and chocolate, Shady Lane’s 2016 is texturally on point and a perfect match for seared venison loin.